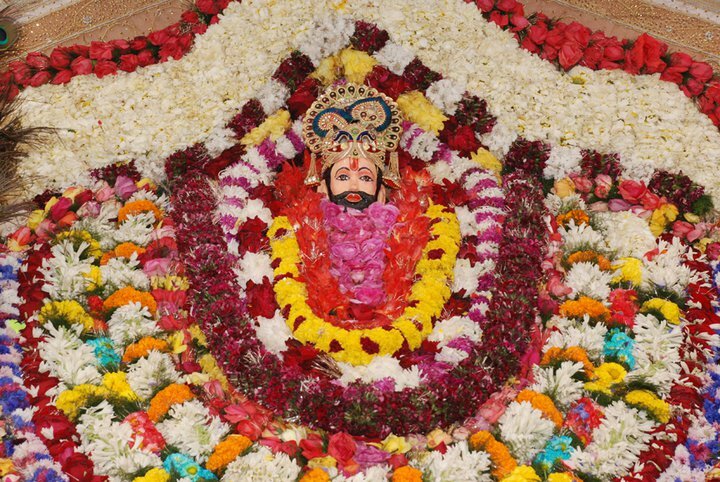 This article lists out the Popular Shri Khatu Shyam Ji Bhajans. Before going forward for all those visitors who are oblivious and do not know much about Shri Khatu Shyam. Here is a brief story. The history of Baba Shyam ji originates from the Mahabharata. Bhima was a Pandava prince, whose son Ghatotkacha was the father of the Barbarika, hence Barbarika was the grandson of Bhima. Owing to the fabulous chivalry and prowess of Barbarika, Krishna did not want him to participate in the great war. As Barbarika got three arrows and he was asked to help the one who is losing, so when Pandavas were losing, he would have helped to Pandavas and when the Kauravs were losing, he would have helped Kauravs. Due to this, it was impossible to get the final result of Mahabharata as neither side was losing. Hence, Khatu Shyam ji is also known as HAARE KA SAHARA. So, Krishna begged of him his head which Barbarika gave him without any hitch but on the condition that he will be allowed to witness the war. Krishna set up his head on a hilltop and also blessed him that he would be deified and worshipped in Kaliyuga like him and that his worshippers shall have their wishes fulfilled. I hope now you all will be knowing Khatu Shyam Ji. Khush Ho Jaye Agar Saanwra: This is the beautiful bhajan sung by Mukesh Bagra. Par Kaat Deta Hai !!!! Haare Ke Sahare Aaja, Tera Daas Pukare Aaja !!!!! Mor Chhadi Lehrayi Re: This bhajan is also sung by Mukesh Bagra. Teri Bahu Badi Saklaayi re, Rasiya O Sanwara !!!! Jaiya Waare Noon Rai Baba, Sona-Chandi Waar Dyu. Gar Zor Mero Chaale, Heera-Moti Se Najar Utar Du !!!! Jinko Jinko Seth Banaya : This bhajan is sung by Baby Jaya Kishori. This is one of my favourite shyam baba bhajans. Unse To Pyar Hai, Humse Takraar Hai !!!! Hone Lagi Hai Ab Kirpa: A beautiful khatu shyam Bhajan sung by Uma Lahri. Naino Ke Raste Prabhu Dil Me Samaa Rahe Ho !!!! Sanwali Surat Pe Mohan Dil Deewana Ho Gaya : This is another beautiful baba shyam bhajan. Sanwali Surat Pe Mohan, Dil Diwana Ho Gaya !!!! Ae Khatu Wale Shyam Main Tera Ho Gya !!!! Mix Dhamaal: Khatu Shyam Dhamaal sung by Nandu ji. Lab Pe Tera Naam Ho : An awesome bhajan sung by Mukesh Bagra. Lab Pe Tera Naam Ho, Jai Jai Shri Shyam Ho !!!! I hope you all will like this playlist and videos of Shyam Bhajans. Share your favorite khatu shyam ji bhajans also in the comments to share with all devotees and also your views and feedback about this article. Don’t Forget To Share it with your friends and subscribe to our Email newsletter for more such updates.